*This part replaces obsolete part #: 195021-6, 194427-5 and 194159-4. 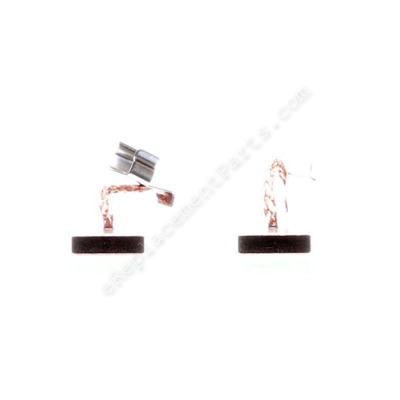 Set of 2 Carbon Brushes with wire lead attached. • Worn brushes frequently are the cause behind a motor running poorly. • Replacing brushes can fix a motor that’s operating intermittently. • New brushes can restore a motor’s electric braking. Carbon brushes are one of the most commonly replaced power tool parts. This is because carbon brushes are wear items, meaning that through friction and use they will gradually wear away until they need replacing. Worn brushes are a common causes of intermittent motor function, reduced electric braking and reduced motor power. A worn-out brush will often be worn down near to the wire lead and can be cracked, pitted, or burned. When replacing carbon brushes, be sure to inspect your armature for burns, cracks, or other damage which can indicate larger motor problems. Brushes worn out, gun wouldn't work properly. Switch stuck, Brushes worn, Lever broke due to Switch Hanging up. Switch would not turn on drill every time. Thought it might have been the switch but the suggested solution for the problem I was having was replace brushes (75% vs 12%) and that's exactly what it was. Remove two screws from back of drill housing. Lift retainer spring off of brush with nail or screw. Pull worn brush out by wire with needle nose pliers and remove clamp at other end of wire. 2. Replaced the broken parts. Carefully pried the retaining spring away from the brushes, and removed them one at a time. Slide the new brushes in place. Routed the wire around the brush holder, and secured the retaining clip. Re-installed the end cap, careful to align the bearing on the shaft with the cut out on the cap, and replaced the two screws. 7. Use the right angle pick tool to pry up the clips. 8. Use the same tool to move the spring arm that holds the brush to the armature. Use the very small divet on the side of the brush holder to hold the spring arm. 9. Remove and reinstall the new brushes, make sure the spring arm is back holding the brush. 10. Slide the brush ring back into place, reinstall the side, spacer and right angle head. Removed the 2 phillips end cap screws to access the brushes. They simply pull out to the holder after I took a pick and held the brush spring off to the side. When replacing the holder you have to separate the two halves of the handle. Not a big job. Just make sure you line up the steel field that the armature turns in. It has a notch in it that has to line up with the one in the handle housing. If you don't do this you can't get the housings completely together and wonder why. This happened to me. Also make sure the detent springs for the High/Low don't fall out when putting the two halves together. Otherwise it was a simple repair. I have done 2 drills so far in our business and plan to get more parts to do more. Parts are identical to the original and are in Makita labeled packaging. Also great pricing. Super slow impact drive, noticed a wire on one side of the old brushes was broken, new brushes installed easily and drill worked good as new! Two screws to remove, pop out old brushes, install new brushes, re-install cover with two screws, smile wide as drill is good as new! Stupidly, I used my drill to mix grout in a 5 gal bucket and the drill got very hot and started to smell. I used it a few times and then it started to work intermittently. Now it doesn't work at all. Any suggestions on what part(s) may be damaged and need replaced? You may want to first check the CB440 Brush Set, to see if they are worn. The item that maybe causing the smell is the insulation on the windings of the 619198-8 Armature. Inspect it to see if any of the wires are darkened and if that is where the smell is coming from. If those items are okay, you may have shorted out the 650583-6 switch. Need more info. On the BHP451 it was common for the brush holder to over heat and melt. Locking the brushes in place. Other then that it would be the switch or broken wire. what is the size of CB 440 ? The dimensions of the CB-440 brushes are 1/2 inch long, 3/8 inch wide & 3/32 inch thick.